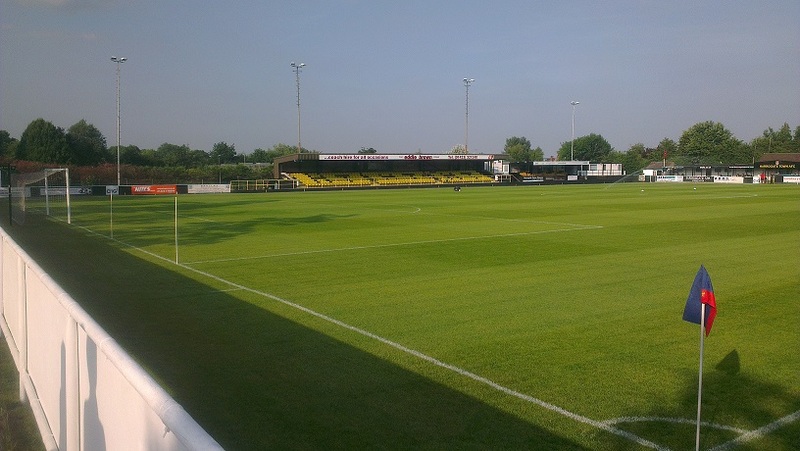 What advice would I give you for visiting Harrogate Town? Ignore your sat-nav. The up to date software on the way up to Wetherby Road tried to take me down a junction of the A1 that didn't exist, took me down two dead ends and directed me onto the wrong road where the road was and numerous others. Infact, one thing I would say about this ground is that it is one of the most difficult grounds to find and almost as tricky to park up at. I can't recall every having this much trouble finding a ground, so much to the extent where I ended but going a mile beyond where it inevitably turned out to be and turning around. It wasn't the best start to the night. I had wanted to visit Harrogate for a while. They (at the time of writing) are managed by one of my favourite former Lincoln players, Simon Weaver, and are therefore one of those sides who I like to keep a look out for. You enter the ground via the south east corner after struggling to find anything to do outside of the ground, and you're met with a ground where the bar is inside, which at the level they are at (Conference North at the time of writing) is quite unusual. Granted, at grounds such as Lincoln United, the bar/food being inside the ground isn't too strange, but at the Conference North/South level every ground I have been to has had it on the outside. Starting clockwise once you enter, the stand to your left is a pitch length terrace that offers a decent view of the action, the strange thing about this stand though is that the roof is fragmented into numeruos pieces along the away, and it isn't a solid structure. The only problem with this stand in general is that if someone stands even at the bottom, they can block of quite a bit of the pitch, but oh well. Continuing around you get to an elevated standing area that is completely flat. It's effectively just a path behind the goal that happens to be a bit higher than the pitch. Despite this, this again offers a reasonable view of the action. Going further around still is the main stand at the ground, a small seated stand that covers roughly 1/3 of the pitch, however, it is not very tall at all, with only 7/8 rows of seats. Despite it's lack of height, this again offers a decent view of the action, although it does fill up fast. Right next to this is what has been designated as the executive area, however, it seems that everyone can see there as I sat there for the entire second half and not once did I get asked to move by the board members of Harrogate. The view of that end of the pitch is excellent, although it is a bit of a struggle to see the other end clearly. The final stand behind the goal isn't even really a stand. 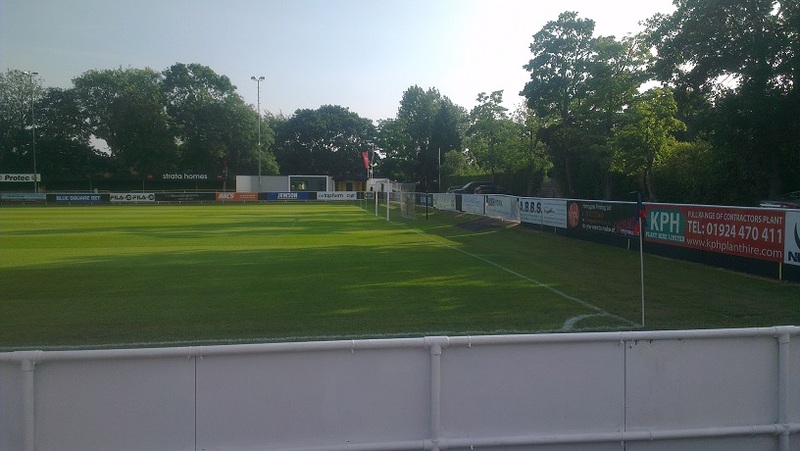 Much like it's opposite, this is just a seemingly flat area that also has the changing rooms as part of it, and a gate that closes when the players are entering/leaving the pitch....this means that if you don't time it well, you could end up being completely stuck there for several minutes whilst everyone else leaves. 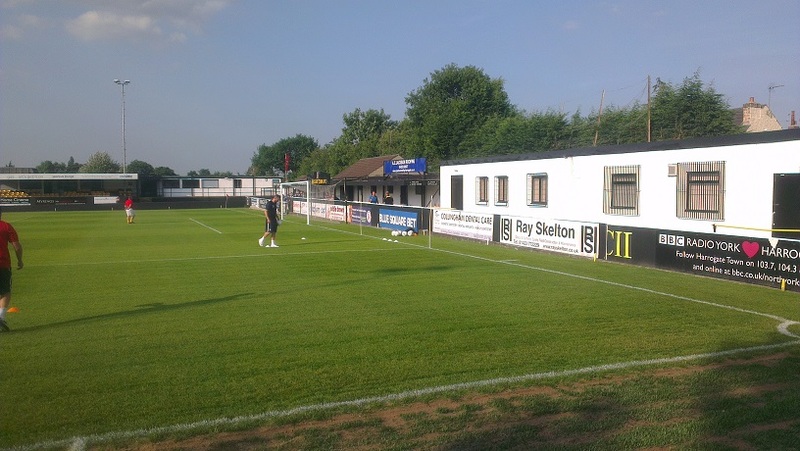 It's similar to to the set up at Lincoln United, but the thing about Lincoln United is that you can go around the back of the changing rooms....you can't here. Also part of this stand is the club bar, which is actually quite nice on the inside, that despite looking very bland on the outside. It is fairly large and offers a variety of non-alcoholic drinks, which makes a nice change from the simple choice of lemonade and pepsi/coke. The food bar is part of the main stand but the prices were a bit hefty on our visit, so I didn't really get anything. My score at the bottom is based on what the person I was with said it was like. The one thing that I would say in it's favour though is that it was made me people there and there, rather than the pre-made crap that you get at Sincil Bank. With Harrogate fans few and far between, I can't really give it a decent rating for atmosphere because there wasn't one really. Infact, a large chunk of their support seemed to be Hull City fans, which was very strange indeed. 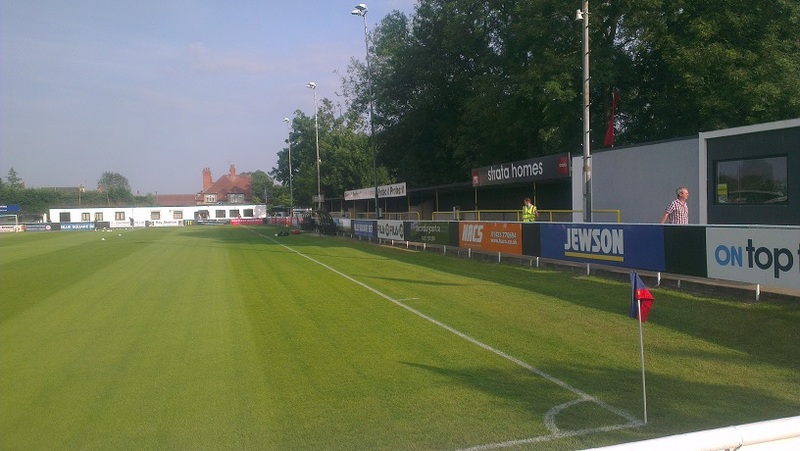 Overall, Harrogate isn't an awful place to go but the difficulty of actually getting to the ground, and then to be greeted with a relatively poor ground, would put me off visiting again, unless it is to see City in a competitive fixture.